Author: Fedorov, V.M., Malov, O.L. 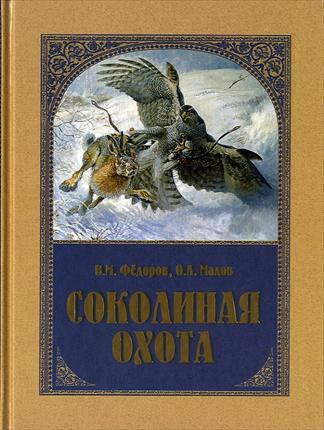 At the end of of the year 2005 Publishing House "Veche" in Moscow has published the book of the large format "Sokolinaya okhota (Falconry)". Authors - Viktor Fedorov and Oleg Malov. As it is written in Preface - this is the first in Russian language the large-scale book, completely devoted to falconry. In fascinating (absorbing) manner in theis book it is telling about the past and the present of the oldest type of hunt with the use of hunting birds of prey. Rare historic facts of the activity by "chase by falcons" by grandee hunters in ancient times are given. Majority of the given materials never was published earlier and are the result of laborious and many-year study of the archive materials. So, in the first time reader can be aquainted with the role and application in falconry of different dog races, to know about the first Russian enthusiasts of falconry. At the same time in the book it is telling also about practice of the use of hunting birds of prey at the present time. This book is illustrated by the rarest engraving, photographs and illustrations of the known animalist of the past and present. In it there are the works of the known in our country and abroad artist on the birds of prey Vadim Gorbatov (see our photographs from exibit "Falconry" at the State Biological Museum named after K.A.Timiryazev (1 October - 27 November 2005). Book will be interesting both for specialists and for wide circile of readers. Fedorov Viktor Mikhalovich (1957, - practioning falconer, who was standing together with other people at the beginning of sources of restoration of falconry in Moscow. Interest to birds of prey, appeared still during childhood, with the time running transformed into the real captivation by falconry. He graduated from Moscow Radiogear-building College, and them Moscow Polygraphic Institute. He spent 5 years in breeding center of dog-breeding. He has finished cinological courses at MOOiR. He is an author of more than 60 publications on different types of hunt, including those with hunting birds of prey. He published his works in "Russkaya Okhgotnchya Gazeta (Russian Hunters' Newspaper)", and also in journals: "Priroda i okhota (Nature and Hunt)" "Okhotnichi sobaki (Hunting Dogs)", "Faeton". He is well-known as collector of ancient engravings and illustrations, which many times were used in different editions by many literators in an area of hunting. Malov Oleg Lvovich (1947) - by education is referent-translator, diplomat, who worked for a long time in the countries of Latin America and Caribbean basin, expert-cinologist of All-Russian category on spaniels and setters and pointers. He is Editor-in-Chief Deputy of "The Russian Hunters' Newspaper" and journal "Okhota i rybalka - XXI vek (Hunt and Fishing - XXI century)". During three years he was author and leading of the popular teleshow "TV-Club of Hunters". He is a President of the Club of Admirers of the Right Hunt "Russian Trophey". He is a honourable member of Assocation "Rosokhotrybolovsoyuz" and Moscow Town Society of Hunters and Fishermen. He is author of 6 books about hunt, hunting dogs and weapons. In the year 2000 his book "German Kurzhaar from A to Z" was awarded by Moscow Town Society of Hunters and Fishermen by literary award named after S.T.Aksakov. The book is published by number of printed copies - 3000, volume - 47 printing sheets (367 pages). Price in Moscow bookshop "Bibliosphera" - 1430 Russian Roubles. High flight of flacon Instead of preface. 9. Chapter 1 Pages of falcon chronicle. 15. Time of Great prince and Tsar hunts. 20. Temple in Naprudnaya sloboda (settlement exempted from normal State obligations). 27. Falcon pleasure (delights). 35. From Imperial to private hunting. 51. Falconers societies (clubs). 51. Falconry at the present time. 53. Chapter 2 Feathered gladiators. 57. Goshawk. 59. Sparrowhawk. 63. Golden Eagle. 66. Gyrfalcon. 72. Peregrine falcon. 78. Small falcons. 83. Prophetic Raven. 94. Hybrids. 109. Chapter 3 Falcon universties. 119. Training (keeping on hand). 119. Chapter 4 Four-legged fellow workers. 145. On European dog for birds. 146. Dog in Russian hunt on birds. 154. Dog in Asia. 163. Borzoi dogs. 173. Hounds. 181. Dachshunds. 188. Setters and Pointers. 192. Spanieli. 210. Dog in falconry. 216. 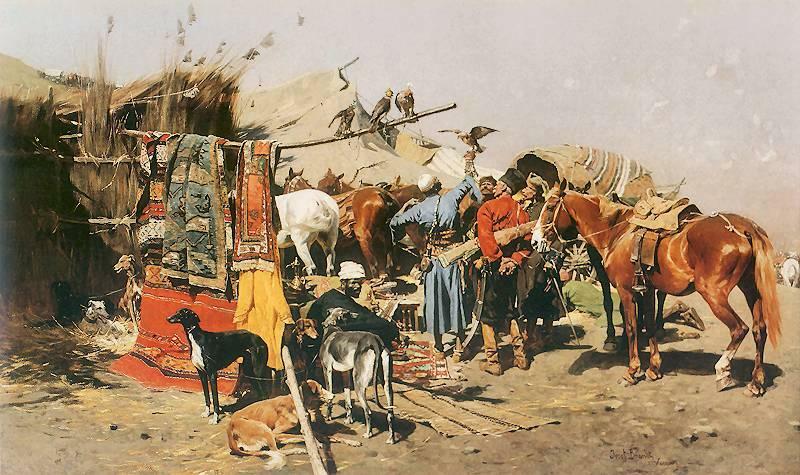 Chapter 5 Great falconers of Russia of the XIXth century. 225. S.T.Aksakov. 226. S.S.Kareev. 232. N.P.Danilov. 239. A.K.Engelmeier. 251. V.A.Klements. 265. K.P.Galler. 284. Chapter 6 Hunt in all times. 303. Hunt on feathered game and on black game (Raven, Jackdaws, Rooks). 306. Hunt on mammals. 334. Appendix Dictionary (glossary) of falconers' termins. 347. Guide of the birds of prey. 366.